First Impression: Xena’s redheaded sister has a workout video! Second Impression: So much velvet. So much purple. So much shine. I don’t know anything about belly dancing, other than that time we ate an 11-course meal at a Moroccan restaurant and some dancers came jingling into the room and embarrassed all the men at the table by draping scarves across their heads. Ah, to have such power! 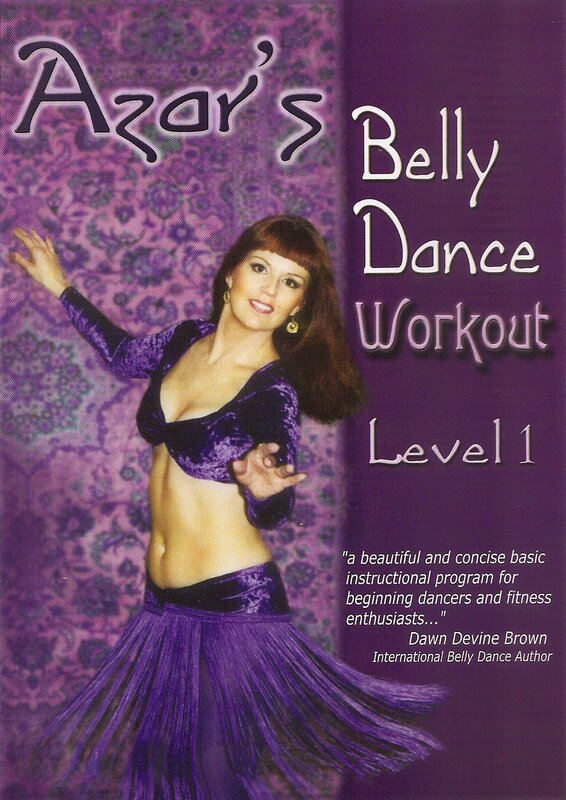 Azar teaches you belly dance from what appears to be the employee breakroom at the Luxor Hotel and Casino. Bookcases are filled with ancient volumes that hint of arcane secrets. Sumptuous fabrics and pillows are strewn about, accented with palms, statues of Anubis, and – is that a hookah? I don’t have a stretch velvet NFL cheerleading uniform like Azar, so I do the lesson in my regular yoga clothes. I recall George Costanza’s affirmation that, were it socially acceptable, he would completely ensconce himself in velvet. The instruction on this video falls into an interesting sub-category, where the teacher does not directly address the camera. Rather, there’s a voice over describing all the moves, which when combined with her looking right into the lens, leaves the somewhat spooky impression that she is teaching you how to belly dance telepathically. Or maybe that’s how it’s actually taught. Like I said, I don’t know anything about belly dancing. The moves were simplified enough so I was able to copy what Azar was demonstrating. I learned to move my hips in a figure eight, do snake arms, and scootch around in a circle to make a Carousel Turn. I also learned how to raise my arms up a beat before accenting with a hip wiggle. All I need are those little clinky finger things! I demonstrated these moves later to someone who was not very impressed. Or maybe the little smile was an effort not to make fun of me. It would seem that, unlike the dancers in that Moroccan restaurant, belly dancing has only given me the power to embarrass myself. Good thing I took care to shut the curtains before starting my first, and possibly last, belly dancing lesson.